1. CULTIC ORIGINS & INFLUENCES - The Word of Faith Movement owes much of its teachings to E.W. Kenyon who was heavily influenced by Mind Science and New Thought Christianity (what became known as Unity School) in the early 1900's. 2. OVERSIMPLIFICATION - Quick and easy solutions to life's problems are offered the believer. There are various "KEYS" or "STEPS" to healing, wealth, financial prosperity, victory in life, etc. 3. ABUSE OF THE BIBLE - A consistent misapplication of Scriptural Texts due to ignorance of Biblical, Systematic, and Historical theology. Analogies, Proof-texting, lack of formal training in Hebrew & Greek all lead to wrong conclusions. 4. 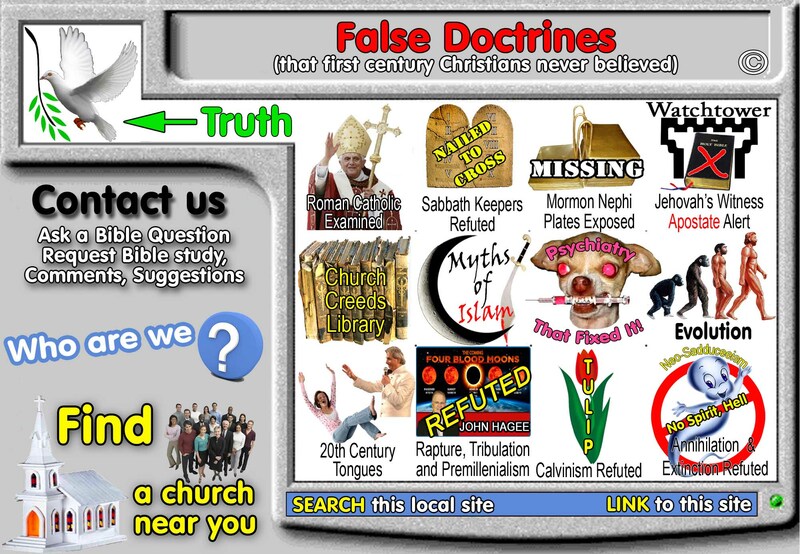 FALSE TEACHINGS - WOF teachers promote a wide variety of false teachings regarding Healing, Health, Prosperity, Demons, Salvation and the Atonement. 5. SPIRITUAL PRIDE - Leaders of the WOF REFUSE to dialog with other members of the Body of Christ regarding their teaching. They claim their teachings come by direct revelation knowledge from God and are not subject to human scrutiny. 6. WORLDLY/HUMANISTIC THEOLOGY- WOF presents a distorted vision of God and the Christian life. God is the supplier of financial prosperity, health, and victory when the believer uses their faith. WOF holds the concept that God's children should "eat the best, drive the best, and wear the best." Little emphasis on suffering from Christ, the cross, self-denial. 7. EXPERIENTIALISM - There is a strong emphasis on feeling and emotionalism versus the use of the mind and intellect. Intuitive guidance from the "hidden man of the heart" versus Bible study. 8. HEDONISM - Stress is on man-centered happiness versus God-centered holiness. They strive for heaven-on-earth now. This is evident in their teaching regarding money and possessions. All of the leading WOF teachers are millionaires or multimillionaires. 9. EXCLUSIVISM - Those who do not subscribe to their beliefs are "carnally-minded." They see themselves as "God's Remnant" and/or His "overcomers." 10. POWER RELIGION - The majority of their teachings and conferences center around "power" and the "anointing." There is a stress on teaching the authority of the believer over Satan and demons. Angels are our servants and we are to command them. 11. LACK OF BALANCE - Teachings stress FAITH, HEALTH, WEALTH, GIFTS OF THE SPIRIT, DELIVERANCE, SUPERNATURAL POWER, VICTORY. Little theology is taught, no systematic Bible teaching. A College Professor Asks: IS IT REVIVAL? There is much talk in Pentecostal circles about recent happenings among us. These happenings are frequently referred to using the imagery of flowing water. Chances are that the quality and genuineness varies considerably from stream to stream, from church to church, and from person to person. The present author has frequently heard the expressions, "Don't throw the baby out with the bathwater," and, "With every fire comes some wildfire. Don't put out the fire." My intention is not to put out the fire. Rather, it is an attempt at identifying the bathwater so that it can be drained, leaving a clean baby in the tub. The following are some questions to keep in mind when encountering anything calling itself a revival. These are in no particular order. 1. IS THERE IS AN EMPHASIS ON THE HOLY SPIRIT AT THE EXPENSE OF JESUS CHRIST, THE SON OF GOD? If the speaker almost exclusively speaks of God and the Spirit, yet rarely speaks of Jesus Christ, there is a danger of lapsing into a practical Binity, or even modalism, instead of promoting the Trinity. However, in the New Testament (esp. John 14-16, Acts 1:8, 1 John 4:13, 5:7-8), the Holy Spirit's main job is described as bearing witness of Jesus Christ. If what is occurring is not bearing witness of Jesus Christ, then it is NOT of the Spirit. Too much of an emphasis on the Spirit runs the risk of planting seeds for a renewed modalism, i.e., the idea that we do not serve a Trinity, but one God who has worn 3 masks: the Father in the Old Testament, the Son while Jesus was on earth, and now the mask of the Holy Spirit. Modalism, which is the prominent feature of United Pentecostalism, has soundly been condemned throughout Church history (and by the Assemblies of God in their Statement of Fundamental Truths). Remember: modalism is HERESY. 2. IS THERE ENOUGH OF AN EMPHASIS ON SCRIPTURE? If the Bible (and its truth) is not emphasized enough, it is LIKELY that whatever is occurring will degenerate into heresy. 3. IS THERE UNCRITICAL ACCEPTANCE OF WHATEVER IS GOING ON? 1 Thessalonians 5:19-22 tells us (in the context of dealing with issues like prophecy) to examine everything carefully. 1 John, right after mentioning that the Holy Spirit bears witness of Jesus, tells us to test the spirits to see if they are from God (1 John 3:22-4:3). Testing the spirits and examining a situation are NOT signs of rebellion, but of submission to the advice of Scripture. 4. IS THE PRIMARY EMPHASIS ON "GOD, BLESS ME," RATHER THAN ON OBEDIENCE? Jesus Christ stressed the importance of obedience, indicating that there will be those who mistakenly think they are right with God because of their involvement in supernatural activities in His name (Matthew 7:21-23,24-27). 5. ARE GODLY CHRISTIANS CONDEMNED IF THEY DO NOT WISH TO PARTICIPATE? Are they out when it comes to God? If this is the attitude, then something is seriously wrong. A person's relationship with God is based on: their acceptance of Jesus Christ, the Son of God, as their Saviour, believing that He is God, that He physically rose from the dead; and their commitment of obedience to His ways. Defining a person's spirituality in terms of whether one endorses a certain set of spiritual phenomena and/or participating in them smacks of gnosticism. It must be remembered that one of the marks of false prophecy is condemning the righteous when God is not condemning them (see Ezekiel 13). A. Related to the preceding point: ARE SOME "IN" AND OTHERS "OUT"? If division is occurring because one group is denying Jesus Christ, then division should occur. However, if division is occurring because one group claims to be more spiritual than another, then there are problems. Remember that the Corinthian church was experiencing the manifestations of the Spirit, and yet Paul called them carnal (1 Corinthians 3:3). The "knowledge" mentioned in 1 Corinthians 8:1 probably refers to people with gnostic tendencies (special spiritual knowledge), not academic knowledge. They thought they were the special people on the inside. B. IS IT IMPLIED THAT GOD SHOWS UP THERE, BUT NOT ELSEWHERE? It could be argued that people are just being sloppy with their terminology. However, there might be more to it. Remember that Jesus Christ said that wherever 2 or 3 are gathered in His name, there He is in the midst of them (Matthew 18:20. Further, the true worshipers of Jesus will worship in S/spirit and in truth, not in proximity (John 4:21-24). 6. IS THERE AN OVEREMPHASIS ON BEING SLAIN IN THE SPIRIT? While this phenomenon occurs in the Bible (Genesis 15:12; Daniel 10:9; Revelation 1:17), it is rare, and even happened to those rebelling against God (e.g. Saul [1 Samuel 19:24], those arresting Jesus [John 18:6]). Being slain in the Spirit is certainly not normative for a Christian, and it is impossible to prove from Scripture that it is even normal. Thus it cannot be seen as a mark of spirituality. 7. IS LAUGHING IN THE SPIRIT ACCEPTED AS A LEGITIMATE EXPRESSION OF SPIRITUALITY? There is no Biblical justification for the idea of laughing in the Spirit. Certainly, joy is a nice thing to have, and it is promoted (e.g. Philippians 4:4; many Psalms), but choosing to rejoice is not the same thing as having a spiritual gift of laughter. 8. IS THERE AN EXTREME EMPHASIS ON MANIFESTATIONS, IN SPITE OF CLAIMS TO THE CONTRARY? To determine an emphasis, ask yourself, "How often is topic X discussed or /promoted?" "How much time in a service is devoted to X?" If something like "going down" is either discussed frequently or a significant aspect of a service, then it is emphasized. 9. IS THERE AN AIR OF PROPHETIC AUTHORITY AMONG THE ADHERENTS? 10. IS IT ASCETIC IN ORIENTATION? 11. IS THERE AN OVEREMPHASIS ON PERSONAL EXPERIENCE? Personal experience does count, and God works with people as individuals. However, the most spiritual among us tends to be fairly dense without an appeal to Scripture. God gave us the Scriptures to teach us how to live godly lives (2 Tim 3:16-17). The heart is deceitful above all else (Jeremiah 17:9), and there is a way which seems right to a person which only ends in death (Proverbs 14:12;16:25). 12. IS THE BIZARRE BEING CONFUSED WITH THAT WHICH IS SUPERNATURAL AND WHOSE ORIGIN IS FROM GOD? God certainly did some things in the Bible which are strange. However, we when we claim to view the Bible as our infallible rule for faith and conduct, it seems as though it provides more than ample examples of what the Christian can expect. If something cannot be found in the Bible, while it might not be UNgodly, it should not be seen to be normal for the Christian, and certainly should not be considered an expected (normative) aspect of the Christian experience. 13. ARE DEEPER COMMITMENTS BEING CONFUSED WITH CONVERSIONS/ SALVATION EXPERIENCES? Deeper commitments to God are wonderful things. May God draw all of us closer to Him and mold us into His image. However, it is misleading to use statistics from deeper commitments as conversion numbers. Further, it is possible that people who really were saved will be led to believe that they were not really saved before some mystical experience. 1 John spends much time reassurring Christians of their salvation. 14. CAN THE CLAIMS MADE BE SUBSTANTIATED? Can reductions in crime, healings, numbers of conversions, etc., be verified? Are claims exaggerated? 15. ARE PEOPLE FINANCIALLY EXPLOITED? This one should speak for itself (see Jude; 2 Peter 2). 16. IS THERE A LACK OF COMPASSION? Compassion was one of the main characteristics of Jesus' ministry (Matthew 9:36; 14:14, etc. ): He is a Man of sorrows and acquainted with grief (Isaiah 58:3). We also are to weep with those who weep (Romans 12:15), and bear one another's burdens (Galatians 6:2). Not all problems can be solved by praying for someone at an altar. Some require developing relationships with people and working with them for a long time.